It was early winter of the year of 2010, both the then Pr.C.C.F. Dr. S. Singsit IFS and the Chief Wildlife Warden Shri A. Kharshi-ing, IFS, of Forest Department were extremely happy with the recent addition of Nongin to the Manipur Zoological Garden brought from Razai Khullen and Shiroi Village of Ukhrul District. The credit went to Mrs. Soreiphy Vasum, IFS, the then DFO/ Ukhrul. The Nongins were not in the State's lone Zoo for the last thirty five years or so as if the bird had been entirely wiped out from the soil of Manipur. There were moments in the mind of the Foresters and wildlife lovers of the State, that it was better to declare another important bird of Manipur as State bird of Manipur because Nongin might have been locally extinct. The rediscovery of the State bird enthused both Foresters and local Naturalists. The rediscovery were the result of many years of awareness campaigns both by the Forest Department and wildlife lovers of the State and also with the award of Rs 50,000.00 (Rupees fifty thousand) on one live pair of Nongins declared by the State Government in the year 2010-11. At least five to six Nongins were handed over by the villagers of Razai Khullen and Shiroi Village to the Zoo authority through the Forest Officials of Eastern Forest Division, Ukhrul just before the celebration of 55th Wildlife Week 2010 at Manipur Zoological Garden. With a serious concern and love for the rare and endangered State bird and for its detailed scientific field study, management and long term conservation strategy in-situ, a team led by Dr. Khangembam Samungou, Retd Reader D.M. College of Science and noted environmentalist, R.K. Birjit Singh, Wildlife Activist and HOD/Life Science, Mangolnganbi College, Bishnupur, Shri Kh. Brajesh Singh, Shri M. Nabin Singh both Video-cameraman with Diploma in Cinematography and myself headed for Razai Khullen of Jessami Sub-Division in a Tata Sumo on 27th November 2010. The Tata Sumo took us up to Shiroi Village. With the help of Chief of Shiroi Village Mr. Achan, we got one local Tata Sumo to take us further to Razai Khullen. Mr. Asem was the driver of the Tata Sumo who was conversant with treacherous terrain and katcha road leading to Razai Khullen. We reached Razai Khullen at around 8.30 PM of the same day and we were warmly welcomed by Mr. Ismail and his friends. In spite of our late arrival, the family members of Mr. Ismail took the arduous work of cooking our food and providing retiring room. Luckily, it happened that Mr. Ismail was the person who had trapped Nongins for the State Zoo. We woke up in the morning, it was Sunday morning and the villagers were busy for attending the Church of the village. So our team decided to request the church authority to allow us to disseminate awareness on the State bird and wildlife conservation in the Church itself, just after the church service. The request was readily accepted and then we mingled with villagers in the church service itself. We were given opportunities to deliver brief lectures, interaction with villagers and distribution of wildlife posters. From the interaction, it was clear that Nongin, the State Bird of Manipur were in plenty in Razai Khullen a few years ago. It is heavily hunted for its meat as it is of almost the size of country chicken. The Pastor of the Church confided us that he himself had eaten nearly two hundred Nongin birds in his lifetime. After the awareness programme, he promised us that he will strive for conservation of the rare and endangered State bird of Manipur through his church. After the awareness campaign, we were provided lunch again in the house of Mr. Ismail. After the lunch we moved in to the jungle in search of the State bird and its natural habitat. Mr. Ismail, his son, Mr. Asem and one local boy accompanied us. Ismail's son and his friend were very happy that they would get surely some kind of jungle meat for the super in the camp. But we cautioned them that no animals should be killed with their barrel guns. On the way many local boys were coming out with catapults and carrying with them five to ten birds of smaller sizes but of different species and of very beautiful colour. After 15 to 16 Km journey on foot we set up one temporary camp with trampoline roofing for the night in the jungle. Team members were on their different routes to capture Nongins live in their still and video cameras, as the villagers informed us that Nongins returned to their roosting place with some big sound at around sunset and they roost at the branch of pine tree at about 5 to 6 feet high. Ismail's son and his friend had to be content with a vegetarian-meal in the cold night in the jungle. But we were unlucky and could not come across any Nongin either in the evening or in the following morning. We came out with heavy heart from the camp area at around 12 noon after spending the windy and cold night in the temporary camp. The villagers assured us to find Nongin in the March or early April when the vegetation were dry and only small pocket of forest were seen because of the annual forest fire resorted by the villagers for hunting etc. We left Razai and reached Shiroi Village at 4 PM of 29th November 2010. We halted at Shiroi for the night in the Village Chief's House. Early in the morning, team members were searching yet another Nongins' habitat in Shiroi Village, but here also we failed. Thus we left Shiroi for Imphal at around 11 AM. Biology & behaviour of the Bird:- Nongin, Mrs Hume bar-tailed pheasant (Syrmaticus humie humie) is a big forest bird of the size of domestic country chicken and a resident bird. It is of Pheasant Group and mostly ground dwelling bird and does not fly very far. They exhibit strong sexual dimorphism, the male are highly colourful whereas the female are of dull colour. The male are much larger than the female. The basic data of a freshly killed Nongin Male bird collected by RK Birjit Singh in his visit on 3/4/2011 were as follows. (2) The total body weight of the male nongin bird was 980 gm. 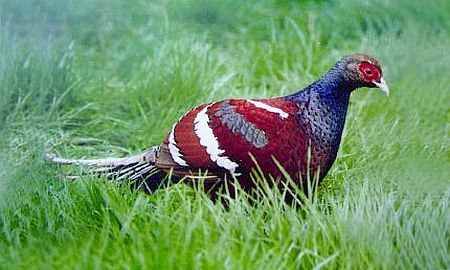 Common Name - Hume's Pheasant, Hume's Bar-tailed Pheasant, Mrs Hume's Pheasant, Mrs Hume Bar-backed pheasant. Local Language/dialect - Nongin, Loining-khoi, Noiningkhoi (Manipuri), Tharikthra (Tangkhul), and Lickashila (Razai). Food of Nongin:- The diet after preliminary analysis of the stomach of the death bird, found to include variety of seed and plant part like leaf and buds in different proportion in different seasons. Seed of Oak or Quercus species (Quercus franchetii), Ficus hispida, Ardisia crenata, Acrophorus stipellatus, Castanopsis delavayi, Daphniphyllum oldhami, Eurya ciliata, Gomphostemma microdon, Hemiphragma heterophyllum, Lithocarpus xylocarpus, Maesa argentea, Millettia longipedunculata, Smilax china, Ternstroemia gymnanthera, Athyrium guangnanense, Pseudocytopteris spinulosa are the major portion of Nongin diet. During winter they also consume larger proportion of fagaceae and ferns and different kind of insects etc. To grind the strong seed such as Qurecus the Nongin also ate small hard stone particle as well. They also take small percentage of Eurya nitida and Lindera nacusua. The feeding strategies of Syrmaticus humie, was selecting high quality food and followed by eating suitable plants from foraging patches. (Analyzed by RK Birjit Singh). Conservation History:- Nongin (Syrmaticus humie humie) was declared as State Bird along with Sangai (Rucervus eldii eldii) as State Animal, Uningthou (Phoebe hainesiana) as State Tree and Shirui Lily (Lilium mackliniae) as State Flower vide Government of Manipur order No 60/5/86-For (pt) Dated 21/3/89. Mr AO Hume the then President of Indian National Congress had studied the bird and the bird had its name as Mrs Hume Bar-tailed pheasant in honour of Mrs AO Hume and presence of white colored bar in the tail or back of the male bird. Conservation Status and threat in India:- The bird is included in the Schedule I of Wildlife Protection Act 1972 according a place among the species with the highest level of protection legally in India. But being a State bird and a flagship species of conservation value, the species was not given the much needed conservation efforts in its natural habitat. The villagers of Razai are not protecting the bird right now and Forest Department also could not enforce Wildlife Protection Act in the village right now as there is no Forest Office in the area. Further the habitat of the birds are susceptible to different kind of uncontrolled resource utilisation such as logging, jhuming and Forest Fire during dry season for hunting etc. IUCN Conservation Status:- IUCN had classified this Bird Species as Near Threatened as on 2008, Vulnerable-2004, Vulnerable-2000, Vulnerable-1994 and Threatened-1988. (The IUCN Red List of Threatened Species). Distribution of Nongin:- There are two sub-species of Nongins viz (Sh humie) and (Sh burminicus). Nongin (S. humie humie) is believed to be found in the Forest of Nagaland, Mizoram and Manipur of India. (Sh, burmanicus) is believed to be found in Eastern Mynmar, South China, and Thailand etc. Habitat Type:- The habitat found in the Razai Village is of Sub-tropical Pine Forest and Sub-Tropical Moist Deciduous Forest. The under storey consists of Schima wallichi, Emblica officinalis, Querecus turbinatus, Qurecus serrata etc. Rajai is at the much lower elevation from Shirui and a bit warmer than Shirui. The nongin bird prefer warmer climate. The bird is found to the lower elevation of Shirui Village but not to the higher reach of Shirui Mountain. Threat to the species at Ukhrul Distrct:- The major threats to the bird are hunting both by Gun or catapults, systematic trapping and habitat loss or shrinkage by different human activities such as logging, Jhuming and Annual Forest Fire. The pine forest in Razai and also in the Part of Razai to Ukhrul, are afflicted with stem borer as most of the pine trees are dying from the top as the leaves start drying from the top until the tree is completely dry. This also may affect the roosting of the bird. Conservation Strategy:- The Razai Forest should be declared as National Park under Section 35 of Wildlife Protection Act 1972 for Nongin, the State Bird of Manipur with local villagers' consent as the best conservation strategy as if Keibul Lamjao was declared National Park for conservation of the State animal, Sangai, way back in 1977. If the community felt otherwise the area may be declared as Community Reserve for Conservation of the diverse Flora and Fauna without changing the community ownership of the land under Section 36 C of Wildlife Protection Act 1972. While settling right and claim of villagers there should be flexible and abundant resettlement package and long term support to the villagers to adopt reduction in natural resource utilisation by providing fuel efficient cooking equipment, providing piggery, poultry scheme and other alternative income generating activities from conservation plan and render abundant helping hands from other line departments or international assistances on priority basis. Non consumptive utilisation of wildlife and wilderness such as eco-tourism/wildlife tourism benefitting the local people should be encouraged in the Razai Village. Further in-depth scientific study both in wild and in captivity of the species and associated species should be initiated at the earliest for long term conservation. Conclusion:- It is hoped that the people of Razai Khullen will sacrifice their age old practice of hunting wildlife, unplanned logging, jhuming etc and they will support the conservation efforts taken up by the State Forest Department to conserve Nongin, the State Bird in the Razai Area. The State Government also would surely take up comprehensive compensatory rehabilitation package for the sacrifice made by the villagers of Razai Khullen. The conservation of Nongin habitat will ensure conservation of representative biological diversity of Razai Region with Nongin as Flagship species of conservation. We are optimistic that we shall be able to conserve, increase the population of Nongin and conserve its habitat in Manipur so as to enable us to hand over the rich natural legacy to our next generation safe and sound. The writer would like to thank and acknowledge Shri A. Kharshi-ing IFS PrCCF/ Govt of Manipur, Shri L. Joykumar Singh IFS DCF/ Park & Sanctuary Division and all the team members for their kind suggestion and improvement of this article. This article was posted on August 03, 2011.